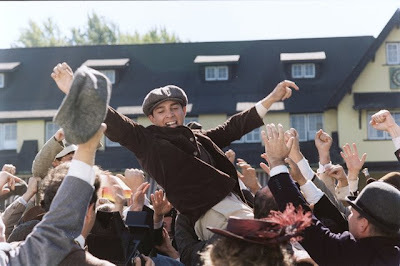 I’m just going to go ahead and blame it on Bagger Vance. The only thing worse than watching golf on television is watching a really dull movie about golf. And sure enough, this was precisely the case when I brought my golf-loving grandfather to the theatre in 2000 to see Robert Redford’s The Legend of Bagger Vance and realized that not only was I bored out of my mind but my grandpa had actually fallen asleep while we’d been sitting there in the futile hope that something interesting would happen. And for those of you who suffered the same fate, I think it's safe to say that, man, nothing ever did. Famously described by Mark Twain as “a good walk spoiled,” I must admit that I’ve never been a fan of traditional golf myself aside from, of course—much like getting a kick out of going with my niece and nephew to Chuck E Cheese to play Skee-Ball and shoot hoops—using every opportunity I could come up with to hit a mini golf location while growing up. There was just something so satisfying about putting a ball through a paint-chipped ‘70s style Flintstones meets fairy tale land that never quite resonated with me in the official version of the game. Mainly it's because golf always seemed like a stuffy pastime considering that the the sport has been dominated by the privileged, wealthy, and mostly white middle aged male demographic (before of course, Tiger Woods became the notable exception). 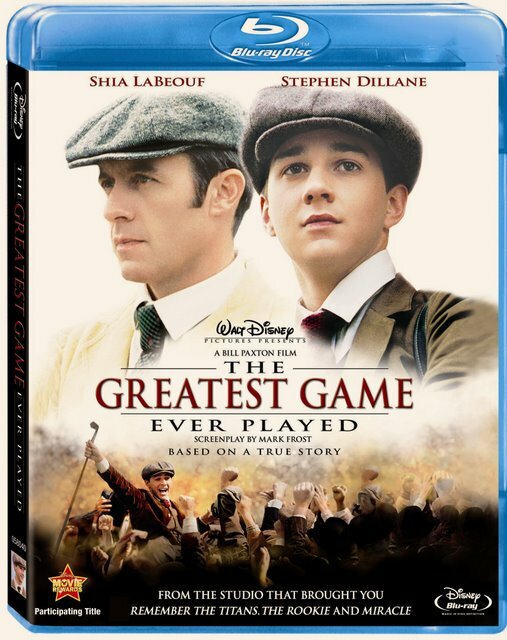 After suffering through the mind-numbingly anticlimactic work that was Bagger Vance, I wasn’t exactly up to checking out a 120 minute period film about the sport when actor turned filmmaker Bill Paxton’s The Greatest Game Ever Played hit theatres in 2005. However, at least the 2005 film had the bonus that Vance didn't since Bagger again condescendingly cast a talented African-American actor (Oscar nominee Will Smith) in a stereotypically thankless role of helping white people find their way a la Whoopi in Ghost or Don Cheadle in The Family Man. Yet this was definitely not Bill Paxton’s fault as I’d been a huge fan of the risk-taking actor who's consistently and passionately pursued lower budget indie films as well as larger studio works moving from One False Move to Apollo 13 to A Simple Plan before directing the incredibly underrated and intelligent shocker Frailty. Likewise, I was also impressed by the employment of an old professor’s filmmaking colleague and friend—the talented cinematographer Shane Hurlbut --whose versatility and ability to light up sequences so that they simply popped as he did in HBO’s lauded The Rat Pack led to higher profile pictures sharpening the gorgeous oceanic landscape of Into the Blue, the overlooked rom-com Something New as well as We Are Marshall, Semi-Pro, Swing Vote and most recently Terminator: Salvation. And now thanks to Walt Disney’s underdog sports themed double release of this film along with Gavin O’Connor’s Miracle onto Blu-ray this month--no doubt to tie in with Father’s Day-- I was finally given the push I needed to take a chance nine years after the Bagger incident had occurred when the studio kindly sent me this film for review. Still dubious that I’d enjoy a golf movie—even one that starred the [then] up-and-coming charmer Shia LaBeouf who is currently attempting to break box office records this week with the release of Michael Bay’s sequel to the smash hit Transformers-- I’m thrilled to admit just how wrong I was when I became utterly mesmerized by Disney’s film which deservedly earned Paxton’s first studio helmed effort a Heartland Truly Moving Picture Award. Described by the filmmaker as not just a true story “that everyone could relate to” but also one that is likewise “the first underdog story in American sports"-- his passion to make the movie for the studio that crafts underdog stories better than all the rest (Invincible, Glory Road, Remember the Titans) shines through right from the beginning of the piece. 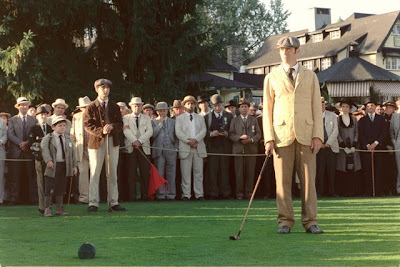 The work which screenwriter Mark Frost adapted from his book chronicles the unlikely match-up of amateur twenty year old golfer Francis Ouimet (LaBeouf) who managed to battle his golfing idol—the British champion often dubbed the game’s best player in Stephen Dillane’s Harry Vardon—for the ultimate victory to win the 1913 U.S. Open Championship. 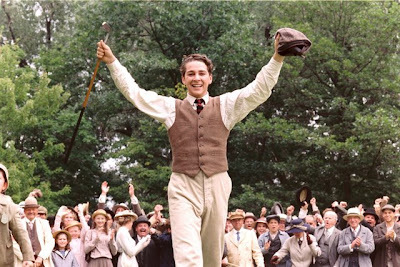 Much like Miracle, which found our young American and relatively inexperienced players psychologically and physically outmatched, LaBeouf’s Francis Ouimet—a former caddie and son of two immigrants—is equally out of his league, trying to better his game by studying the one perfected by Vardon which he’d broken down in his nonfiction work on his golf methodology. 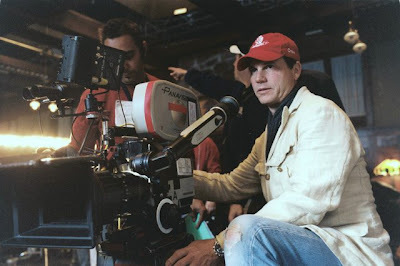 However, while we never got to meet the opposing team or see them as anything other than the opposition in Miracle—the fascinating thing about this film is that Paxton and Frost take the time to fully develop both characters whom we realize have much more in common than one would assume. 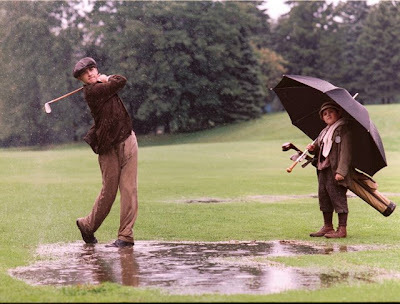 Moments into the movie we discover that both grew up as poor underdogs near golf courses (or in Vardon’s case being evicted from his property as a child so that a course could go where his home had been) and later they realize that despite being naturally gifted with a club and a ball, they’ll never be respected as “gentlemen” of the game. The emphasis on class differences and the elitism of some in the field in their treatment of the players as they climb the ranks hoping to be treated as equals makes the nearly one hundred year old story still resonate quite strongly today. 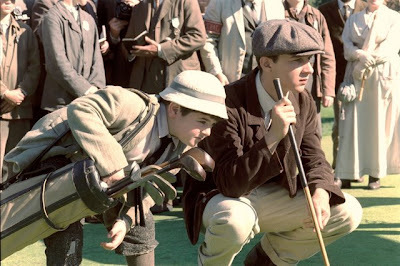 Furthermore, it’s even given a great Disney outsider addition when Ouimet hires a fifth grade, ten year old caddie named Eddie (Josh Flitter) who almost manages to steal focus from the entire movie towards his adorable, supportive presence. Yes, of course there’s a few plot points that feel a bit forced to make certain that the movie completely follows the genre mandated pattern such as Ouimet’s crush on the wealthy club owner’s daughter that’s cast aside when the game begins in addition to a few other minor crises about their struggles to prove themselves worthy and overcome the psychological aspects and feelings of insecurity. However, the filmmakers bravely switch up the typical presentation of these events. Unafraid of venturing into the fantastical area of magic realism that one has a license to incorporate into filmmaking-- Paxton makes the intriguing, assured and incredibly effective decision to bring their insecurities to life visually via Vardon’s memory of the men in black hats who took over his land as a child when his nerves threaten to overtake him on the golf course. 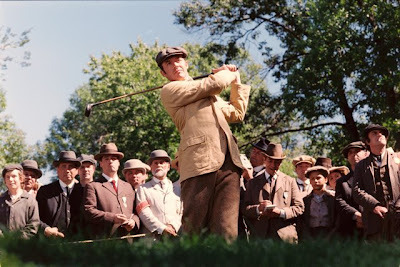 Equally powerful in his decision to make sure the game never comes off in easy quick shots of the ball flying through the air and a cut to where it lands, in the last almost full hour of the film which brings us right inside the game, Paxton illustrates his commitment to “celebrate” the beauty of golf as a game by bringing in a “sequence conceptual consultant” to film CGI enhanced shots. Thus he enables us to view golf in an entirely unprecedented way often with a constantly moving camera. Making it just as appealing as a brightly colored mini golf course, the filmmakers use rapid editing and the seamless movement of slow motion to fast motion as we zoom in to see a lady bug on a ball, we feel like we’re soaring through the trees along with the golf ball, and go underneath the tee to watch a swing from a vastly different angle. 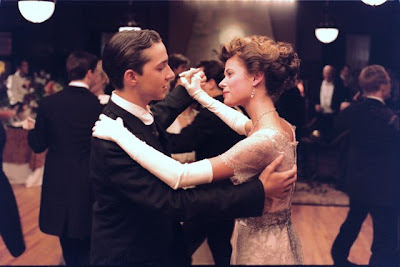 In doing so, Paxton, Hurlbut, the technical consultants and his editor Elliott Graham take a "kids in a candy store approach" to cinematic trickery in a technically imaginative style with the decision not to let the 1913 setting pigeonhole them to a classic period production feel. Although some may have a problem with the anachronisms they infer from the “show-off” style—by pulling out all of the rabbits they can find in the black hats of the men that haunt Vardon--Paxton has set his film apart in a way that not only manages to entertain on a higher level than most by-the-numbers underdog stories but also as a work of art that I feel should be mandatory viewing for film school editing, special effects, and cinematography courses. And now it's heightened even more so on Blu-ray in the longstanding, typically exceptional Disney tradition of an ultra clear transfer of the film to its full HD 1080 pixels. Further boasting sound that manages to capture everything from the wind blowing leaves on trees to the sound of the ball moving through the air—it’s the best way to experience the picture in tandem with numerous extra features including two separate commentary tracks, a rare news archived video of Ouimet in the ‘60s, and behind-the-scenes footage wherein Paxton thanks every single major crew member by name. Still, far from just dazzling us with what they can do in a way that LaBeouf likened to Paxton’s decision to shoot it “more like a war film”-- with the use of mini remote controlled looking airplanes attached to cameras and choreographing everything in addition to story-boarding the scenes to break it down again and again-- admirably throughout the film, The Greatest Game Ever Played always remains emotionally satisfying from start to finish. Much more than just a golf movie and one that honestly manages to top most of the other Disney features from the underdog true sports sagas they’ve become as known for as animation—Paxton’s film is a remarkable hidden gem that’s well worth your time, even if you’re still suffering from post-traumatic Vance disorder.